Ray Downey was the Fire Department of New York's Chief of Special Operations and a passionate New York Rangers fan and founding member of the FDNY Hockey Team. He served with the United States Marine Corps and then became a member of the Fire Department of New York (FDNY) on April 7, 1962, beginning a 39-year career. In August of 2001, Chief Downey was put in charge of Special Operations Command, a team of specialists who aid regular firefighters with unique or highly critical situations, which include Hazardous Materials, Marine Units, Rescue Companies (experienced units with specialized tools and equipment) and Squads, often regarded as mini Rescue Companies who also have specialized tools and equipment. Downey was also promoted to Deputy Chief at the time. His career was built on numerous successful rescues which made him the most decorated man in the history of the FDNY. He received five medals for valor and 16 unit citations as well as the 1995 Administration Medal. 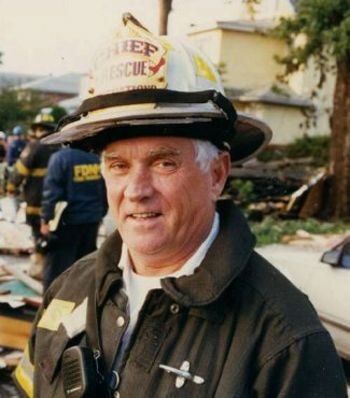 Additionally, Chief Downey was a task force leader for the New York City Urban Search and Rescue Team as well as the National Disasters Team, who responded to both the Oklahoma City and Atlanta Olympics bombings. He was also a team leader in response to Hurricanes Hugo, Andres, Fran, Marilyn and Opal, Chief of Rescue Operations at the World Trade Center bombing in 1993, all of which contributed to his being called "a charismatic national legend in rescue circles" and he was credited with creating the modern search-and-rescue system adopted by FEMA and fire departments worldwide while pioneering a national network of eight search and rescue teams under FEMA. He also made frequent trips to Washington D.C. while serving on a congressional panel on domestic terrorism and it's prevention. All of this led to Downey commanding rescue operations at the World Trade Center on September 11, 2001 following the terrorist attacks earlier that morning when hijacked jetliners were crashed into each of the twin towers. His unit was called in immediately after the first impact at #2 World Trade Center and he was leading the rescue operations which helped save thousands of lives when the second of the towers collapsed, costing him his life. He left behind his wife Rosalie and five children, two of whom, Joe and Chuck, are now firemen. It would take eight months after 9/11 for his remains to be identified through DNA testing before Chief Downey was then laid to rest on May 20, 2002. When once asked asked why he searched so long for remains of those presumed dead, he cited the families of those left behind. "The only way you can relieve some of their sorrow," he said, "is to successfully recover the bodies of the people they loved." Of the 343 firefighters lost on 9/11, Special Operations Command lost a total of 95 men with 1,600 years of experience that day. Ray Downey's life and career are commemorated with The Ray Downey Courage & Valor Award, which is presented each year to an extraordinarily courageous American firefighter. 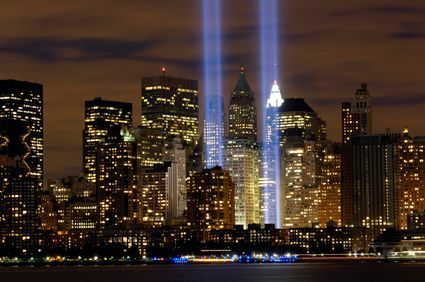 Following the terrorist attacks in September, 2001 the New York Rangers and Buffalo Sabres faced off in the Rangers first home game of the season on October 7th. 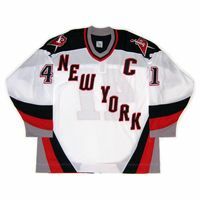 Both the Rangers and Sabres wore special jerseys with "New York" diagonally across the front. 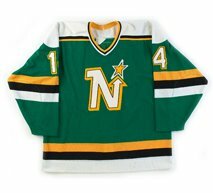 Following the game won by the Rangers 5-4 in overtime, both sets of jerseys were auctioned off to raise money for the Twin Towers Fund. Prior to the game the NYPD and FDNY hockey teams lined up on the ice and the Rangers skated between them during their introductions. FDNY team member Larry McGee had brought Ray Downey's firefighters helmet with him with a picture of Downey tucked into the brim of the helmet. 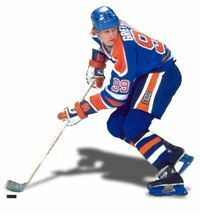 He noticed that of all the players, only Rangers captain Mark Messier had not worn his hockey helmet during the pre-game ceremonies. As the Rangers were lined up at the blueline, McGee sensed the moment was right and skated over to Messier with the helmet and told him it would be an honor if he would wear it. 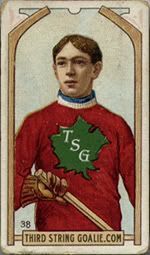 Messier responded, "Sure, whatever you need" and donned the helmet of the still missing Downey as the Madison Square Garden crowd roared it's approval. 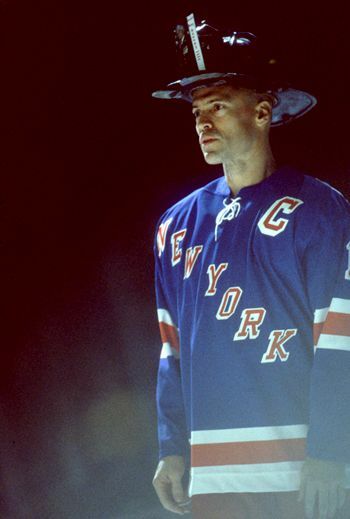 Mark Messier wearing Chief Downey's helmet prior to the Rangers first home game following the 9/11 terrorist attacks. 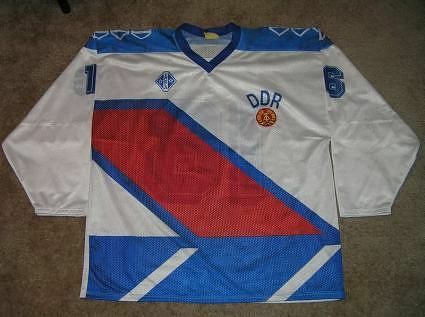 Note the special "New York" jersey worn only for that game. "For me, personally, it was very emotional for a lot of reasons," said Messier, "Obviously, with all the people being honored - the firefighters, the police, the rescue workers, the volunteers, the entire city - and all our fans. All on a day when we started fighting back as a country." 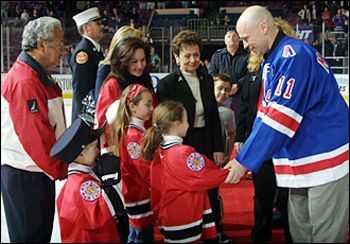 At the end of that same season, Mark Messier presented his #11 jersey to the family of Ray Downey during the Rangers annual Blueshirts off our Backs night on April 10, 2002. 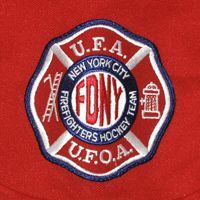 The FDNY Hockey Team was first formed back in 1968 and played it's first game against the New York Police Department in 1974 and the FDNY Hockey Team now competes in charity events and tournaments from Alaska to Sweden as well as hosting the FDNY "King of the Ice" Firehouse Tournament, where for over 15 years nearly 100 different firehouses compete for the championship in the largest tournament of it's kind. Since February, 2001 the FDNY Hockey Team, through the Teddy Bears That Care Program, has distributed over 26,000 Teddy Bears to children across the United States and Canada. The main event on the FDNY Hockey Team calendar is always their annual faceoff against the New York Police Department (NYPD) game as the FDNY Bravest take on the NYPD Finest in "The Battle of the Badges". To date, 39 games have been played with the FDNY holding a 22-15-2 lead in the series. 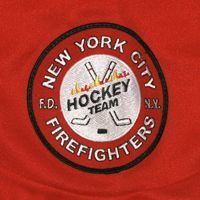 2012-13 FDNY team tryouts begin on Saturday October 4th, 2011 and continue on October 11th, and 18th. Tryouts are from 11:00 am to 1:00 pm at the Aviator Sports Center in Brooklyn N. Y. Any questions should be directed to Bill Kammerer at 516-897-0449. 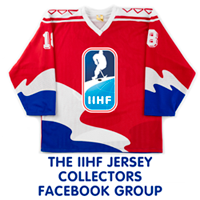 Today's featured jersey is a 2000-01 Fire Department of New York Hockey Team Ray Downey jersey. 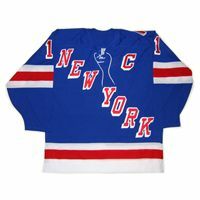 This jersey takes the classic simplicity of a jersey very similar to the New Jersey Devils and combines it with the timeless look of the drop shadowed New York Rangers cresting and numbers to create as perfect a hockey jersey as you will ever see. 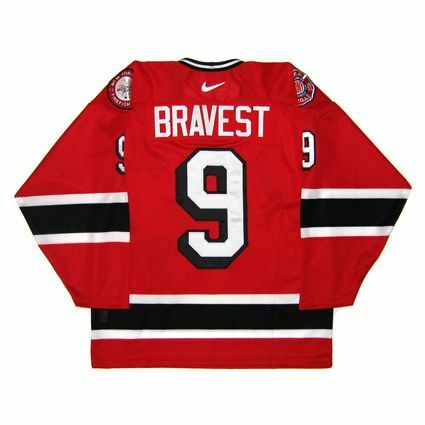 Of note, none of the players wore their individual names on the back of their jerseys, and instead they all had their team nickname "Bravest" on the back in place of their names, similar to Team Canada in the 1972 Summit Series when they all had "Canada" on the back. 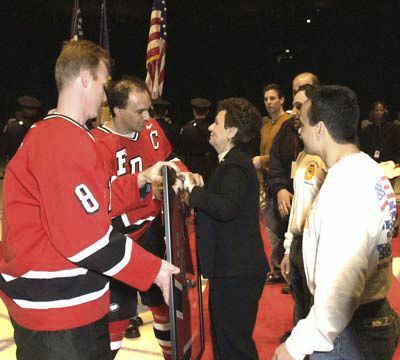 Chief Downey's jersey #9 was retired by the FDNY Hockey Team during a pre-game tribute at the March 2, 2002 FDNY vs. NYPD hockey game. 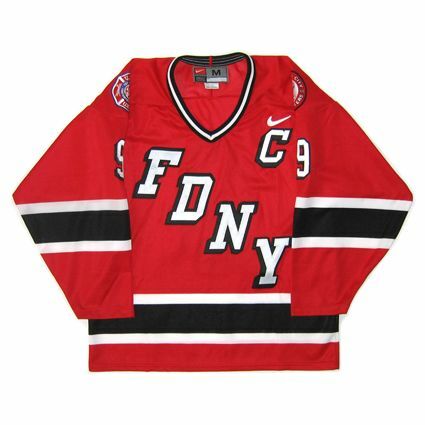 While this style jersey has been retired, you can get the current FDNY Hockey Team jersey, based on the 2000-2007 Calgary Flames jerseys, at the official store for FDNY gear - The Fire Zone at Rockefeller Center at 34 W 51st St. in New York, New York. Please take a moment to visit the Deputy Chief Raymond Downey Scholarship Charity Fund, at ChiefRayDowney.com, which holds the annual Deputy Chief Raymond M. Downey Memorial Golf Outing and the Forever Running Memorial 5K Run/Walk each Father's Day to benefit the organizations he supported, and consider making a donation to the fund. Information on how to contribute can be found by clicking the banner below. The Rescue Company, written by Chief Ray Downey, a how-to manual on rescue operations for firefighters in both paperback and hardcover, as well as his instructional video on collapse rescues are available below. The Last Men Out, written by Ray Downey's nephew Tom Downey, is about Rescue 2, the firehouse Ray Downey commanded for fourteen years. Rescue 2 doesn't leave a fire until everybody's safe - they're the last men out.